Hey, I love Star Wars as much as the next guy who happens to have his hair tailored in a Leia Organa cinnamon bun style from Episode IV: A New Hope, but that franchise has been around for a while. It’s starting to look quite old, even though said antiquity is in a way timeless. Still, I’m keen to see what an updated Star Wars would look like. And Square Enix has done just that. And then some! Boba Fett comes with interchangeable hands, a heavy blast, a pistol, knives, flamethrower effect, jetpack effects and a figure stand. The Stormtrooper also has interchangeable hands and a heavy blaster, a blaster pistol, a pistol effect piece and a figure stand. Each one will cost you around $100, as Republic Credits aren’t accepted in this part of the galaxy. 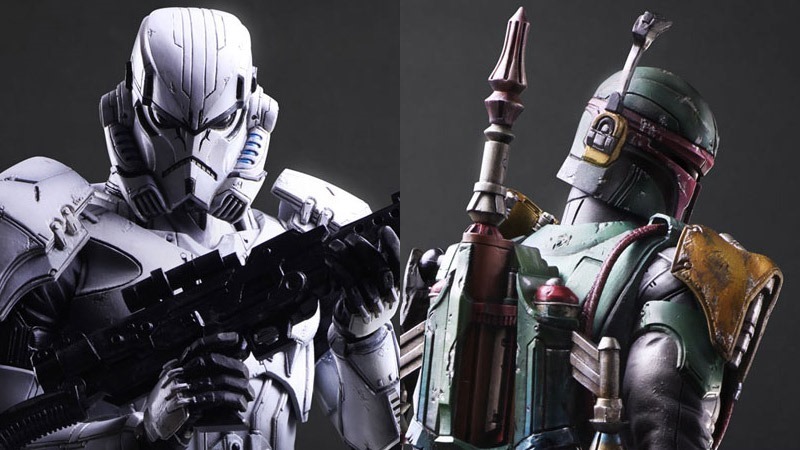 They’ll be released in July, and hot damn, I just cannot get enough of that Boba Fett. This might put a damper on my PC build, as I’ll need to buy several Stormtroopers in order to form an ace squad of Rebel scum hunters. Seriously, if that guy had been in Star Wars Episode VI: Return Of The Jedi, he’d have made mincemeat of Luke Skywalker and his Scooby Doo gang. I MUST HAVE IT! Next article Why can’t you find co-op partners in Bloodborne?